Circa 1907. "Aerial bridge. Duluth, Minnesota." 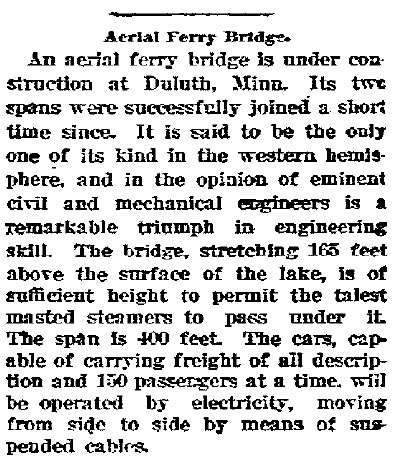 Suspended Car Transfer over the Duluth Ship Canal. The gondola could carry 60 tons of cargo across the 300-foot channel with minimal obstruction of the shipping lane. 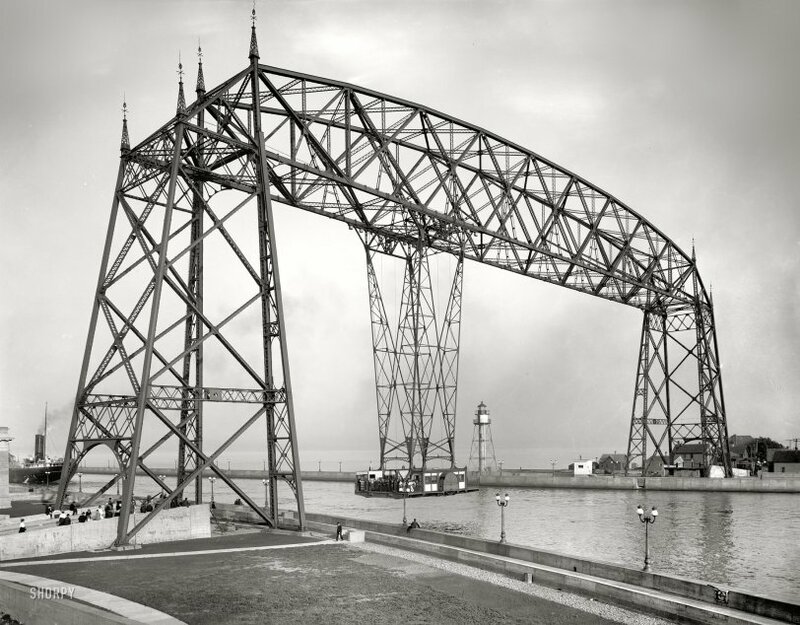 After modification for service as a vertical lift, the span became known as the Aerial Lift Bridge. 8x10 dry plate glass negative, Detroit Publishing Company. View full size. Submitted by Funimag on Sat, 09/20/2008 - 6:15am. What was the energy to move these two vertical cables? Steam engine? Electric engine? Where was located the engine? How it was possible to turn these two lateral pulleys? Any suggestion is welcomed! Submitted by G. Niebuhr on Wed, 09/03/2008 - 4:22am. Submitted by k2 on Mon, 09/01/2008 - 7:11pm. Submitted by Funimag on Mon, 09/01/2008 - 12:11pm. Yes, only one Aerial Lift Bridge (pont transbordeur) still remains in France. It is at Rochefort on the Charente River. But the most famous french one is that of Marseille which was destroyed in 1944 during WWII. Don't forget also the Biscaye Bridge in Spain. Do you have such great pictures about the old Duluth Incline (1891-1939) which was going up to the Beacon Hill Pavilion? Submitted by Barry on Mon, 09/01/2008 - 6:31am. I have lived near Duluth almost my entire life and this is the first time I've ever seen a good picture of it, before it was converted. It is the symbol of the city - Thanks Shorpy! Submitted by DHM on Mon, 09/01/2008 - 4:31am. There are two such bridges here in the UK. The one at Middlesborough is still operational, while that at Newport is closed for repair. Submitted by Mike in Seattle on Sun, 08/31/2008 - 11:47pm. The same bridge, now modified as a vertical lift. Note the navigation light tower is still there are are the spires at the top of the towers. Submitted by Jeff on Sun, 08/31/2008 - 7:31pm. There's a bridge just like this in the marvelous opening sequence of the 1966 Jacques Demy movie "Les Demoiselles des Rochefort." Technicolor and dancing; it's really something to see.